OK, so tonight’s Rockhoppers blog-writing tipple of choice is a well known brand of alcoholic Ginger Beer. (“You don’t have to have a drink to write a blog, but it helps…”). Scrum. Anyway – like bin day, the blog is a day late this week due to the Bank Holiday. (Insert your own joke about rubbish here). This Bank Holiday weekend saw the RT team revelling in our gorgeous Westcountry surroundings, including a sponsored walk on Dartmoor to raise money for pooches with epilepsy (who knew eh? ), enjoying a rather splendid meal at River Cottage in the Royal William Yard (fabulous food from Mr Hugh F-W) and finally a trek through Cardinham Woods in search of a Gruffalo (No joke. 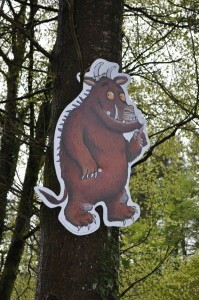 You really can go and hunt a Gruffalo…). All of this was rather splendid, but also rather outdoorsey, so it was lovely to spend Bank Holiday Monday in the serene surroundings of the Moorland Garden Hotel, manning the RT stall at the Moor Things Vintage and Lovely Summer Fete, organised by the always reliable Miss Ivy Events. As always, the day was well organised with bags of character and atmosphere, and from a personal point of view, we had a stonkingly good day with loads of interest in our products (especially our beautiful range of handmade pinnies from What Jess Did Next – after all you can’t get much more vintage than a frilly pinny…). The only dampener was the fact the hog roast pretty much sold out before I got to it (humph – too busy having such a lovely time with the bloomin’ customers, honestly…). But my empty stomach aside, the day was a big success – it’s great to see the vintage and handmade scene is alive and well in the outskirts of Plymouth.